Brackenhurst on the e-learning map! On 1 October, Brackenhurst Primary School hosted their first e-learning open day, making them the first public primary school in South Africa to go the full e-learning route. The school invited all parents and other stakeholders to an informative morning to understand and experience first-hand what e-learning in a South African public school entails. Ms Anne Burger, principal at Brackenhurst Primary, was described as the engine behind the e-learning project and her vision for the school. “We know where the school is going,” Ms Burger said. “In the beginning of 2012 we developed a three-year strategy and by the end of 2014 we are right on track.” By implementing the e-learning system in the school, they are keeping abreast with technology and living up to their mission statement of “Passionately educating today,for tomorrow.” The school now has two fully equipped computer labs with internet access and children attend computer lessons. Teachers are also being trained on an ongoing basis. From January 2014 up until September 2014, the implementation of the e-learning programme took place. 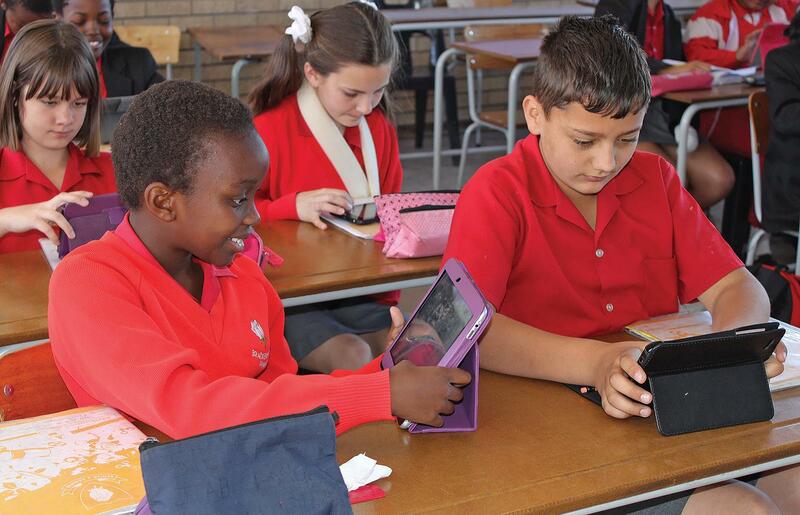 Currently 80% of Grade 4 – 7 learners have tablets, but they have ensured that the remaining 20% are not falling behind, as they are still receiving hard copies of handbooks and other study material. They are pulling out all the stops to try to get tablets into the hands of the remaining 20% as well. The school received 40 tablets from the Gauteng Department of Education (GDE); however, the school was broken into and all 40 tablets were stolen. “We are in the process of seeing how we can solve this challenge,” Ms. Burger said. The school found that the e-learning system has learners more involved in lessons and that they enjoy the activities and assignments.